The Skilled Migrant Category of New Zealand Residence Program is available for those candidates who have the skills to contribute to New Zealand’s economic growth. To receive an invitation to apply, you first need to send us an Expression of Interest (EOI). The EOI requires you to mention details about your employment in New Zealand, work experience, and qualifications. If your Expression of Interest is successful you would be offered the opportunity to apply to live and work in New Zealand indefinitely. 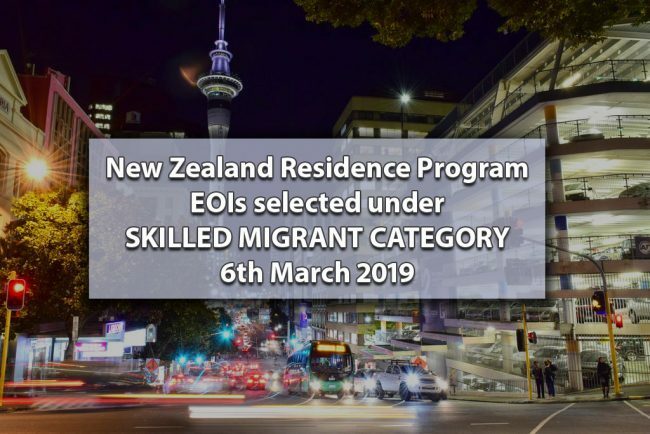 The most recent selection of Expressions of Interest (EOIs) under the Skilled Migrant Category took place on 6 March 2019 As a result 635 EOIs that had a total of 160 or more points, representing 1,395 people will now undergo preliminary verification to determine if an invitation to apply for residency will be issued. There are 573 EOIs in the pool after the selection. If you are interested in process your immigration for New Zealand, Australia or Canada, Immigration Experts is here to take this onus. We ensure that your profile is submitted in a proper manner. You may also subscribe our Youtube Channel to get frequent updates regarding various immigration programs.